Ladhope Golf Club, Galashiels, 7 pm for a 7.30pm start. 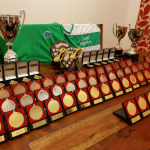 Celebrate the club’s achievements over the last 12 months with our medal and trophy presentations for seniors and juniors. It’s been quite a year!!! Light buffet served so please come along. Seniors, juniors, coaches, parents, partners are all most welcome. You can let us know if you are coming via comments on Facebook. click here for the link.